71% of companies believe there is a likelihood of modern slavery occurring at some stage in their supply chains (Ethical Trading Initiative, 2015). This statistic is terrifying, and it’s easy to feel paralysed when we think about how we use our spending to make a difference. Examples of products that can have slavery in their supply chains include: clothing, roses, jewellery, rice, mobile phones, makeup, coffee & chocolate (IJM UK). Watch Thaiyamma’s story (6 minutes long) to see how families can end up enslaved, it is hard hitting but also beautiful and hope-filled. Thinking ahead to Christmas, there are different fun ways to buck the trend of excessive consumerism: make gifts, give experiences, buy second hand or support local creatives. Another option is to intentionally buy from companies who are actively working against human trafficking, or who have clear supply chains. Fairtrade may not be perfect, but it’s a good start – the Fairtrade standard prohibits child labour and ensures fairer pay and conditions for farmers and workers, hopefully providing ways out of the intergenerational cycles of poverty that push vulnerable people into situations of exploitation and trafficking. Here I have gathered a few companies, from personal recommendations, who are operating with clear supply chains, and are looking to empower people across the globe. It’s inspiring to read the stories of businesses seeking to value people over profit, using their creativity as an act of resistance. I’ve also given an example from each company of a potential gift (under £40). It’s incredible that our spending can improve situations in the supply chain, and help to promote freedom. I have featured UK based companies with international links (for those in the States, Scraping Raisin’s Ethical Gift Guide to Love People & Help Our Planet looks good). Some companies are directly involved in anti-trafficking work, others are promoting fair trade, employability, education or other social enterprises which help to create an inhospitable climate for exploitation and trafficking. The hope is that we can work together to Make #SlaveFree Normal. Just Threads are a Scottish founded company “born from re-imaging consumerism into a way of giving rather than just getting”. They create ethically made clothes and accessories and give £5 to one of their partner charities from every product sold. They have tops for men and women and I adore their Loved Kids’ Tshirt (this slogan is also available on a tote bag). You can get 15% off your total order by using the code hopebreathes. Carishea produce a range of skincare products and they are involved in social justice work on a variety of levels from their source in Ghana to their factory in Greenock. In the Bulisa District of Ghana they are working, trading and establishing a shea nut and butter co-operation for women. In Greenock they are partnering with the local prison and addiction rehabilitation services to build an employability programme. This Shea Scot Whipped Body Balm proudly merges the two countries, with Scottish honey alongside local Ghanaian ingredients, and costs £8. They also have gift sets and a range for men, and have been featured as one of the SmallBiz 100, so you can get a discount of 10% by using the code SmallBIZ100. The One World Shop is an Edinburgh based business selling toys, accessories, homeware, food, drink and Fairtrade Footballs. They have been sourcing and selling fairly traded products since 1983, and also support schools, faith communities and local businesses in adopting and promoting fair trade. If you’re looking for an ethically sourced sweet treat, they have a range of fairly traded chocolate options including this Artisan Milk Chocolate Selection for £12. The chocolates are palm oil free, and hand made in the UK with ethically sourced cocoa from West Africa. Enter HOPEBREATHES into the coupon code box for 10% off (this doesn’t include shipping and expires 31/12/18). Paperchain Jewellery are based in Northern Ireland, and work with a team on the ground in Uganda helping to support street children through a number of projects (including Dwelling Places who have Glasgow links). They sell beautiful handcrafted jewellery made from traditional paper beads, such as this lovely Benjamin necklace available in a variety of colours for £26 from their website. Enter HOPEBREATHES10 at the checkout to get 10% off until the 5th December. These are the ‘Umi’ Dungarees in maroon, available for £40. Lucy & Yak will be donating 10% of all their sales over Black Friday weekend to a grass roots charity in India that provides education for girls from underprivileged backgrounds. Know The Origin sells a range of fashion labels that all seeking to have transparency in their supply chains. For each product you can view a map of where it was made and the ethical standards it was made under. They also have some helpful resources like this blog post about Human Trafficking and Fashion. This Black Bodycon Dress is £40 and made in India from Fairtrade cotton. Rapanui make clothing (t-shirts, jumpers, socks & bags) from organic cotton in a renewable energy powered factory on the Isle of Wight. On their website you can enter the order number of your product to see it’s journey from ‘seed to shop’ and ‘meet’ the people who made your clothes. There are a few Rapanui tshirts on regular rotation in our house. This Camping Tshirt is £19, and once your product is worn out, you can freepost it back to Rapanui for store credit. Dalit funds the work of Life Association, in education and care of children of the Dalit community in India (also known as ‘the untouchables’). They sell candles (all named after children in their care), spices and other gifts made by Dalit people in India. This spice set is £16.99 and includes 6 different ‘essential’ curry spices. There also is currently a special offer to include a candle snuffer for £1.50 when you buy one of their premium hand crafted clay pot candles. 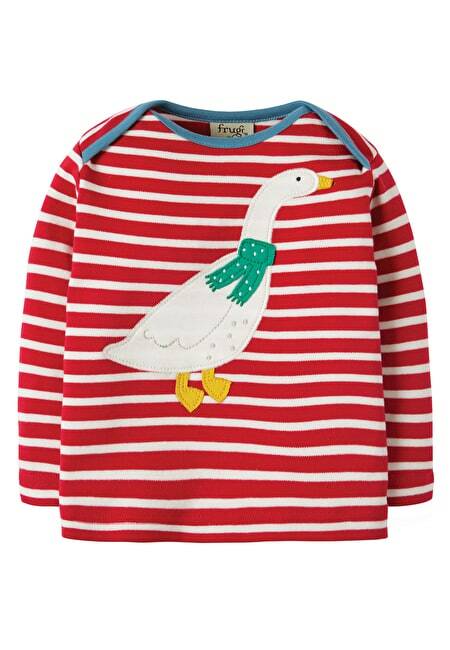 Based in Cornwall, Frugi make colourful kid’s and maternity clothes from organic cotton ‘grown by farmers we trust’. They seek to have long standing relationships with their suppliers around the world, who they visit often (see their Code of Conduct here). Their vibrant Christmas range includes this Bobby Applique top, for £19. They have a Black Friday sale on until Tuesday, and will have other promotions in the run up to Christmas. Edinburgh – born OutsideIn sell wooly hats and sweaters, and are passionate about tackling homelessness. Their product materials are ethically sourced and a fair, living wage is paid at each stage of production. Each product comes with a ‘giving item’ such as a beanie, for the customer to give to someone in need (or OutsideIn can on your behalf). As OutsideIn say “this ‘Wear One, Share One’ model encourages people like you to go way beyond meeting a mere physical need”. This ‘Hope Sweet Hope‘ sweater might just be going on my Christmas list (£38). If you want to give directly to anti-trafficking work, the IJM Gift Catalogue gives you the opportunity to choose a global region or specific area of their work that you would like to support. For instance you could choose to ‘Combat Slavery’ and then you choose your donation amount and whether to print or send a card directly. Lush committed at the start of this year to remove all mica from it’s production. There are concerns about child labour in the mining of mica, a mineral used to give sparkle or shimmer. Lanka Kade sells delightful fair trade wooden toys made in Sri Lanka. They are educational, colourful and fun. The company’s ethos is “to build long-term, sustainable trading partnerships that provide stability and protect local skills”. Myakka are based in Somerset and sell Fairtrade solid wood furniture from India & Thailand, alongside lighting, rugs and accessories. People Tree and Nomads Clothing both sell gorgeous Fairtrade clothes and accessories. Traidcraft stock a wide variety of Fairtrade products (including lovely festive wrapping paper) and Amnesty International sell interesting ethical gifts with the proceeds supporting human rights work. Waitrose sell bottles of Fairtrade Shiraz and Chenin Blanc from the Cederberg region of South Africa. They are involved in a range of projects to support thriving, self-sustaining farming communities. IJM (International Justice Mission) is the largest international anti-slavery organisation in the world. The IJM UK Website has great information about how our buying patterns can impact on human trafficking. Their Make #SlaveFree Normal campaign has recommendations of brands, and suggestions for how we can take action against modern day slavery. If you are in Glasgow, we have a group formed from a number of churches called Restore Glasgow who are partnering with IJM to explore how we can support anti-trafficking work in our city. We’re hosting a Spot the Signs training event on January 26th 2019, where we’ll learn how to spot the signs of modern day slavery in our city. Disclaimer – I’m not receiving anything from these companies, just the joy of sharing good stories! and here I thought I was almost done with christmas shopping… 🙂 good list!